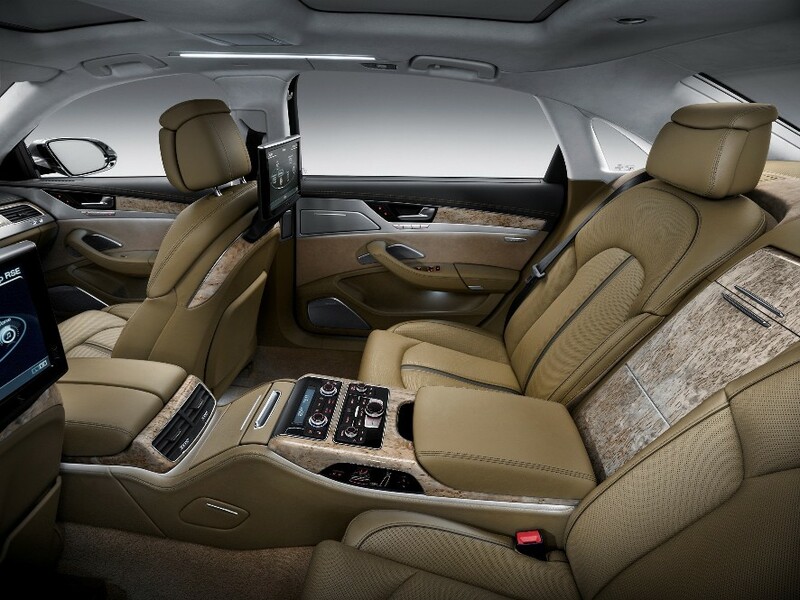 The 2012 Audi A8 can be defined as a work of art worthy of display. The true engineering that went into the development of the A8 is hidden under a component of luxury and sophistication that takes the high end luxury sedan to a whole new level. This new generation of the iconic Audi brand presents a combination of style and elegant design with a sporty engine and transmission for the most discerning palates. The A8 has high levels of comfort imaginable at a base price of $78,750. The Audi A8 is set to fight its main rivals the BMW 7 Series and S Class from Mercedes Benz. But the Audi has a level of technology that gives the A8 an advantage over the competition. Audi presented in this opportunity an advanced new multimedia interface with a pad that reads commands with the touch of fingers such as the touch pad of a laptop computer. This system, which Audi calls the MMI touch is synchronized with the navigation of Google-Earth to provide perfect navigation. Find a restaurant, gas station or shopping center is very easy but fun too. Think having a computer at your fingers while driving. The MMI touch also functions to activate the navigation map, control the audio system / CD, Bluetooth phone. The MMI also understands voice commands. The 2012 Audi A8 offers many driver safety systems. The Adaptive Cruise Control with Stop & Go will automatically slow the vehicle while cruise control is engaged. The Night Vision Assistant with a thermal infra-red camera lets you see for pedestrians, animals, and obstacles in the dark. Audi Side Assists keeps an eye on all your blinds spots and issues an alert if you try and unsafe lane change. Audi Pre Sense notices and helps to prevent front end collisions. So if your foot slips off the brake at a stoplight, the Pre Sense will stop the car. To complete the driver experience, the Audi A8 has an awesome audio system from Bang & Olufsen. How does 1400 watts and 19 speakers sound? The all-aluminum skeleton in the Audi A8 is not only lightweight but also strong which adds to both performance and also fuel economy. Most automobile chassis are made from steel, but the aluminum more rigid and also much lighter. The different suspension settings allow drivers to choose between performance or comfort; you can adjust the settings to fit your needs. 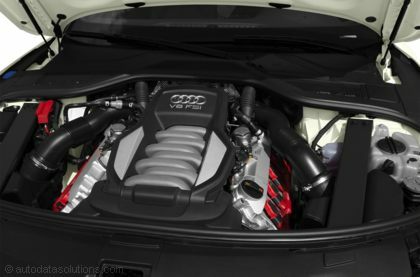 The Audi A8 has an optimized 4.2-liter V-8 engine with FSI direct injection. The A8 makes over 370 horsepower and 328 lb-ft. of torque. Fuel economy is 18 MPG in the city and 28 MPG on the highway. The transmission is an ultra smooth 8-speed automatic. The speed and accuracy of the new A8 is in large part to the permanent 4-wheel drive dubbed Quattro. Power distribution of 40/60 percent between the front and rear wheels under normal conditions and when necessary the system has the ability to send 80% power to the rear wheels. In terms of speed, the Audi A8 in 2012 exceeded the mark of 0 to 60 mph in approximately to 5.6 seconds. Fuel consumption is over 15% more efficient than the previous generation. The 2012 Audi A8 is a contender for the crown when it comes to the full size luxury segment. Audi vehicles are the most sophisticated and best looking cars on the road today. See current Audi offers on new cars. A lease is a gret way to get into an expensive car for very little per month.